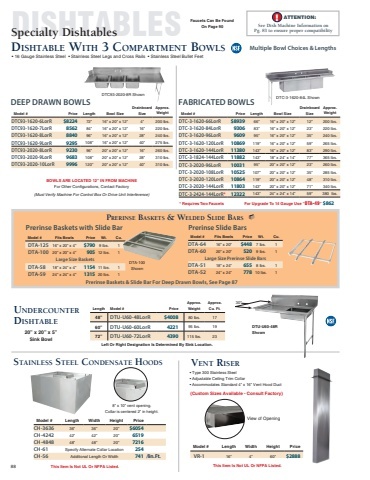 BFreeAStaRndinHg BaAr HNandD/DumSp SIinNks KS Bar Hand SinkS Bowl Size: 10” x 14” x 10” • 29” Working Height • 4” High Backsplash Includes 1-1/2” IPS Drain & Galvanized Legs w/ Adjustable Galvanized Side Cross-Bracing & Adjustable Plastic Bullet Feet Add SU-10A For Stainless Steel Leg & Stainless Steel Bullet Foot Upgrade w/ Front-to-Back Cross-Bracing $230                    18” Wide Units • 4” O.C. Splash Mounted Swing Spout Faucet Model # Price Overall Approx. Approx. Length Weight Cu. Ft. 21” Wide Units • 4” O.C. Deck Mounted Swing Spout Faucet • Rear Deck For Extra Storage Overall Approx. Approx. Model # Price Length Weight Cu. Ft.  SL-HS-12  $799  12”  31 lbs. 5 SL-HS-15 846 15” 34 lbs. 6  CR-HS-12  $832  12”  32 lbs. 6 CR-HS-15 875 15” 35 lbs. 6     Hand SinkS w/ Built-in Soap & towel diSpenSerS Bowl & Faucet • 29” Working Height • 4” High Backsplash Includes 1 1/2” IPS Basket Drain & Galvanized Legs w/ Adjustable Galvanized Side Cross-Bracing & Adjustable Plastic Bullet Feet Add SU-10C For Stainless Steel Leg & Stainless Steel Bullet Foot Upgrade w/ Front-to-Back Cross-Bracing $230   21” Wide Standard Units • 4” O.C. Deck Mounted Swing Spout Faucet • Rear Deck For Extra Storage Overall Approx. Approx. Model # Price Length Weight Cu. Ft. 18” Wide Units Available - Consult Factory 21” Wide Side Splash Units • 4” O.C. Deck Mounted Swing Spout Faucet • 4” High Stainless Steel Side Splashes • Rear Deck For Extra Storage Overall Approx. Approx. Model # Price Length Weight Cu. Ft.  SC-12-TS  $1168  12”  45 lbs. 4 SC-15-TS 1195 15” 49 lbs. 4  SC-12-TS-S  $1382  12”  50 lbs. 4 SC-15-TS-S 1418 15” 54 lbs. 4     Hand Sink acceSSorieS & ModificationS   Add Wrist Handles K-316-LU $109 For Deck & Splash Mount Faucets Replacement 6” Splash Mount Faucet Replacement Deck Mount Soap Dispenser K-12 $137 Add A Side Splash For 18” Wide Units SU-18R or L $161 SU-18RL $325 For 21” Wide Units SU-21R or L $175 SU-21RL $341 Chrome Towel Ring A-15 $96 Packed Loose Stainless Steel Leg Upgrade • Includes 2 Sets of (2) S/S Legs w/ Adjustable S/S Bullet Feet & Adjustable S/S Front-to-Back Cross-Bracing • Leg Heights Do Not Include 1 1/4” Bullet Foot Height SU-10A $243 18” Legs SU-10C $243 14” Legs    K-125 4” O.C. $281 6” Spout  Replacement 6” Deck Mount Faucet K-51 $430 4” O.C. 6” Spout  For Our Full Line Of Modifications & Accessories, See Page 112-114. 88 WARNING: Equipment that includes a faucet may expose you to chemicals, including lead, that are known to the State of California to cause cancer or birth defects or other reproductive harm. For more Info.,visit www.p65warnings.ca.gov.